Scenic Tamiami Trail? The Tamiami Trail, or US Highway 41, or SW 8th Street or Calle Ocho, yes, that's all the same road, is better known by the locals as the road that takes you to the middle of the Cuban scene in Little Havana. But after you enjoy your cortadito, this same road extends further all the way to Florida's west coast to Naples, cutting through the heart of the Everglades and passing through some very striking landscapes teeming with wildlife. 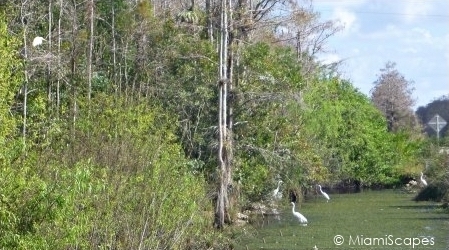 The Tamiami Trail will bring you to many of the State's natural crown jewels, Everglades National Park, Big Cypress National Preserve, the Fakahatchee Strand Preserve, and the 10,000 Islands to name a few, and offers access to many others in the neighborhood, the Florida Panther National Wildlife Refuge, the Corkscrew Swamp, etc. 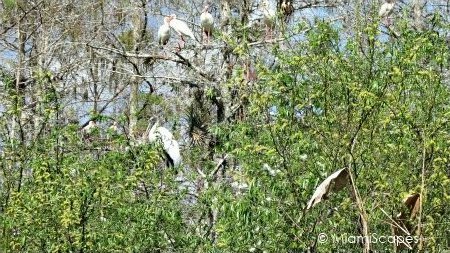 It is at the very center, crossing the Big Cypress Preserve, that it is the most scenic. 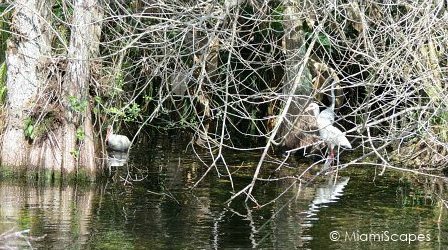 There is a canal running parallel to the Tamiami Trail's north side, which is where wading birds and alligators congregate. So for a better look, you want to take this road going from East to West, that is, from Miami to Naples. This road, unfortunately, is not a "sightseeing road", in fact, traffic is heavy and fast, it is not safe to stop on the side of the road to watch wildlife, but there are many spots where you can safely stop to have a look, have a picnic, take photographs, and enjoy the nature. 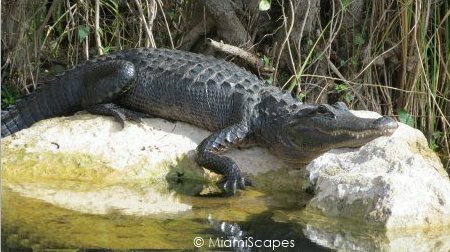 There are no entrance or park fees to any of the above except for the Shark Valley Visitor Center of Everglades National Park. 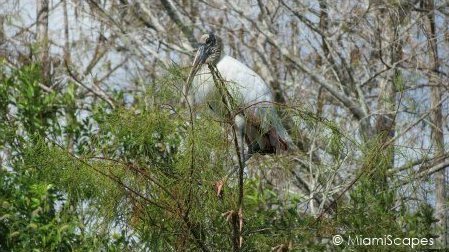 Driving through the Tamiami Trail you find that you are entering and leaving several different parks, preserves, and refuges, but for our purposes, this is all part of the Greater Everglades regardless of which government or environmental unit oversees it. 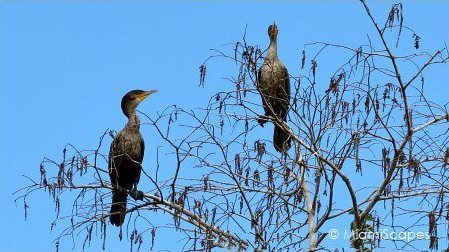 It is during the dry season mid-November through mid-April, that the road is the most scenic and wildlife is prolific. 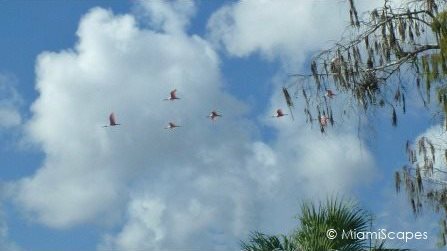 Even a flock of those elusive Roseate Spoonbills flying overhead! 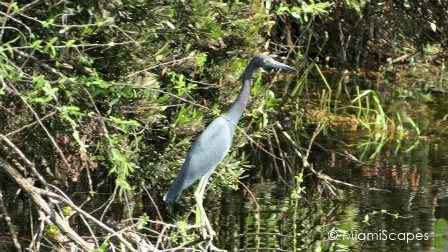 There is much to see if you just take the time, pull on one of the safe parking spots, stop at one of the Visitor Centers, bring a picnic, it's a great way to spend the day, regardless of how far you get on Tamiami Trail. 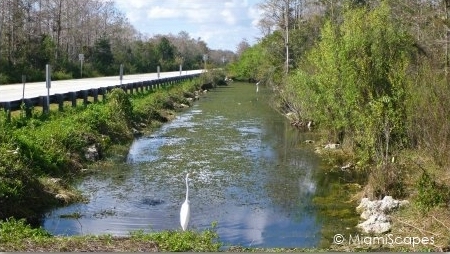 As mentioned before, this is not a "sightseeing road", there are very few eating facilities and gas stations, absolutely nothing in the stretch through Big Cypress, so bring refreshments and fill up your tank before you get much further. 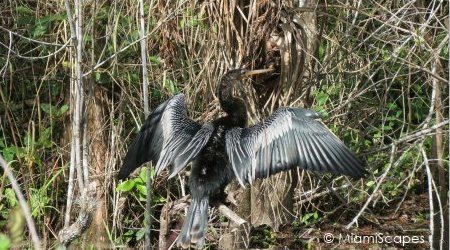 Most facilities you will find at the ends, closer to Miami in the East or Everglades City on the West. Also note that there is ongoing construction along this road and delays are inevitable. Take that into consideration in your planning. 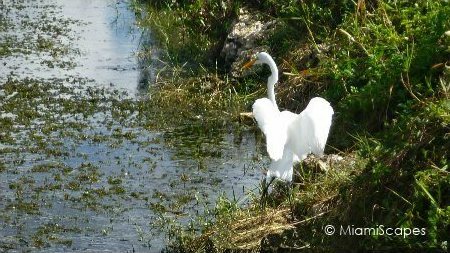 The construction is all part of the Comprehensive Everglades Restoration Plan, a multi-billion dollar project and the largest hydrologic works ever undertaken in the United States with the aim to return the flow of water in the Everglades to its historical levels. The scope of this 20 year project is unprecendented.